#4 DUKE 91, WAKE FOREST 73 – Andre Dawkins kept knocking down 3-pointers for No. 4 Duke, and those noisy Cameron Crazies chanted "'Dre all day." Turns out his hot streak only lasted one half-but that was more than enough to help the Blue Devils beat Wake Forest again. 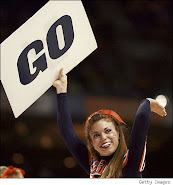 #15 VIRGINIA 70, GEORGIA TECH 38 – No, sorry Yellow Jacket fans, that’s not a misprint, that’s 38 points total. Mike Scott scored 18 points and No. 15 Virginia bounced back from a tough loss at Duke, blowing out Georgia on Thursday night. The Cavaliers (15-2, 2-1 ACC) were never seriously challenged by the Yellow Jackets, who put up their lowest-scoring game since a 53-38 loss to Wake Forest on Feb. 6, 1982, during Bobby Cremins' first season as coach. Virginia was coming off a 61-58 defeat at Cameron Indoor Stadium that snapped a 12-game winning streak. The Cavs wasted no time getting started on a new streak, taking advantage of a team that doesn't have a true home arena. N.C. STATE 76, BOSTON COLLEGE 62 – N. C. State's well-balanced attack overwhelmed youthful Boston College offensively and defensively on Thursday night at the RBC Center, as the Wolfpack picked up its third ACC victory of January with a win over the Eagles. Junior Scott Wood led four Wolfpack players in double figures, scoring a game-high 16 points in the contest, thanks in part to his four 3-pointers. The Wolfpack, the ACC's second-highest scoring team, sizzled all night on offense, shooting 51.3 percent from the field on the night, while holding the Eagles to 40.3 percent shooting from the field. Sophomore C.J. Leslie added 14 points, while junior Richard Howell had his sixth double-double in the Pack's last eight games, with 11 points and 16 rebounds. Sophomore Lorenzo Brown also had nine points and 11 assists, his first double-figure assist total against an ACC opponent. The Heels came out of a presumably blistering locker room and went on a 19-0 run to take control of the game. Harrison Barnes scored nine of his 27 points and John Henson added 16 points, 16 rebounds and six blocks for the Tar Heels (16-3, 3-1 ACC), who trailed 44-36 before Barnes started the run with two free throws, a jumper and a dunk. Before it was over, it stretched to 31-5 and a 67-49 lead with 8:23 remaining. 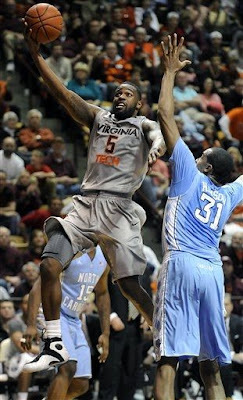 The Hokies (11-7, 0-4) missed 15 straight shots during the run and lost their fourth straight. They are off to their first 0-4 start in league play since the 2006 team lost its first six. Pulled from the starting lineup in favor of Robert Brown after 0-8 three-point shooting in Virginia Tech’s prior three games, Hudson was honored before the game for joining Virginia Tech’s 1,000-point club. When he checked in at the first media timeout, he quickly established that he wanted to get busy on the scoring the next 1,000.